Il blog di Artemide Aste su numismatica, monete e medaglie. Articoli sul mondo classico, monete romane e greche, monete medievali e medaglie papali. Marcus Aurelius was born Marcus Annius Verus. His grandfather held the position of consul three times, and was also a senator and praetor. Both Marcus and Lucius Verus were adopted by Antoninus Pius in 138 A.D. . Marcus was the nephew of Antoninus’ wife, Faustina the elder. He later married Antoninus’ daughter, Faustina the younger. Imperial power was given to Marcus by Antoninus Pius on his deathbed. Marcus went on to persuade the senate to grant equal power to Lucius Verus, thus creating joint emperors. This lasted until Lucius’ death in 169 A.D., at which point Marcus ruled as sole emperor. During his reign, he wrote extensively in the form that today would be considered a diary, which was published after he died. Today, he is considered the most philosophical of all the Roman emperors. Marcus’ wife, Faustina, often followed him on military campaigns, and it was on one of these that she died. Marcus proceeded to have her deified. 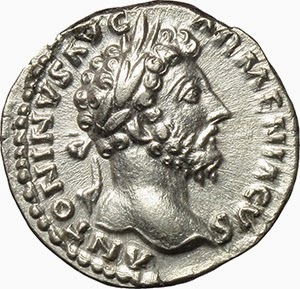 Due to long, extended military action during his reign, the economy experienced great stress, and this forced the debasement of Rome’s silver coinage. Marcus named his son, Commodus as Caesar in 166 A.D,, and had him appointed as joint Augustus in 177 A.D., once again creating joint emperors. Upon Marcus’ death in 180, Commodus reigned as sole emperor.